A traditional High Tea in the most traditional of Scottish settings. 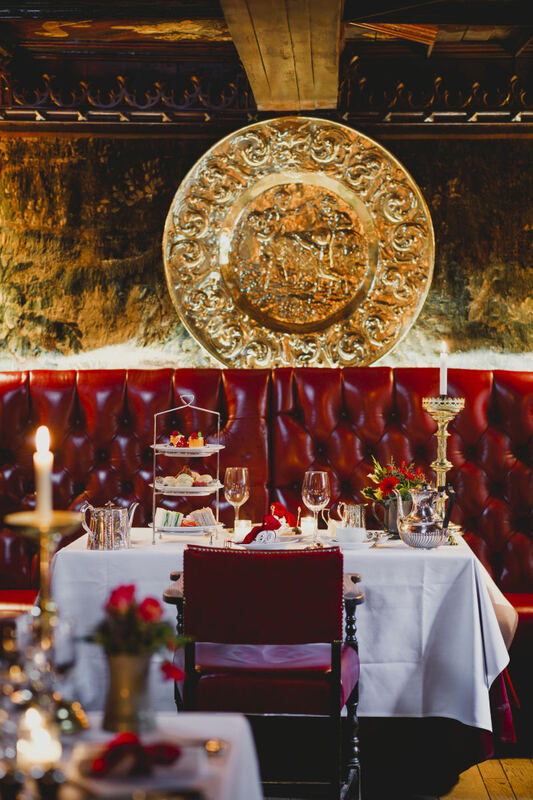 The Witchery's Afternoon Tea is served in both the sumptuous and light Secret Garden room as well as our decadent baroque candlelit Witchery diningroom. Whichever room you choose, you can expect delicious sandwiches and cakes piled high on silver cake stands, with a big dose of Witchery magic! Our pastry team work hard each day to create inspired sandwich fillings including, Edinburgh Gin cured salmon with dill creme fraiche on rye bread and honey roast gammon with Arran mustard mayo on brown bread. There's plenty of sweet treats too with freshly baked scones, dragon cake and chocolate choux buns to name a few. All served with your choice of specially selected loose leaf tea. This decadent treat is available Monday - Friday from 3pm until 4.30pm.